For a few years when I was younger my family and a few other mad people did a mid-winter swim. One weekend, near the shortest day of the year, we would gather at Princess Bay on the Wellington south coast. Our cars would be packed with blankets, woollen socks and woollen jerseys, lots of towels and too much polar fleece. We had picnic baskets full of soft bread rolls, berry muffins and thermos of hot drinks. The adults would stand on the beach drinking coffee for a while, hands curved around the white plastic cups. My sister and I would walk around the tiny, black sand beach looking for rock pools and writing our names in the sand. Usually it was a sharp, clear winter day. We could see the Kaikoura mountain range, too close and too white for running into the sea. Other years a biting southerly wind tore through the Cook Strait and hypothermia was quite a serious threat. We would all change into our swimwear. I remember floral swim caps and beach shoes. A few in wetsuits, but mostly they were brave in summer togs. My sister and I were made to wear wetsuits, though I longed to be big enough to wear togs too. A few more minutes of hand wringing then the towels and blankets were dropped. We ran into the water, arms flailing and knees rising, as if trying to propel ourselves out of the sea. Some dived straight through the small waves, but most of us ran out to waist depth and plunged under, the freezing water catching at our lungs. Back on the beach we pulled polar fleece over our still wet bodies, wrapped around towels and put on hats. The coarse sand stuck to our feet, piercing like needles. We stayed on the beach, trying to warm up. The adults drank mulled wine and hot orange juice. I remember my sister and I sitting in the open boot of someone’s car next to the thermos of mulled wine. We could smell the warm spices and citrus aromas. We poured ourselves a tiny cup and had a sip. It was hot and sweet and tasted like berries and orange. Later in the afternoon we would meet at someone’s house for a mid-winter feast. These meals were an eye opening experience for me as a child. My sister and I sat at the table with the grown ups. We had wine glasses with sparkling grape juice and proper knives and forks. One year we had goose. I tried quail eggs and ate brussel sprouts. Another year there was Golden Soup with carrot and orange. But what I remember most clearly is the year my mother made sticky date puddings. This memory, according to my mother, is mostly fabricated in my head, but this does not make these puddings any less special. In some sort of “Alice in Wonderland” state of child wonderment these date puddings were made in tea cups. They were caramel in colour with rich streaks of soft date and each one slightly domed. Our tea set was white with tiny blue squares around the rim and in a matching jug we had butterscotch sauce. We ate our puddings in their little cups on saucers; they seemed so exciting and so grown up. I have held on to this made up memory for a long time. I told my mother about it a few months ago and I was slightly crushed to discover it hadn’t happened as I remembered. 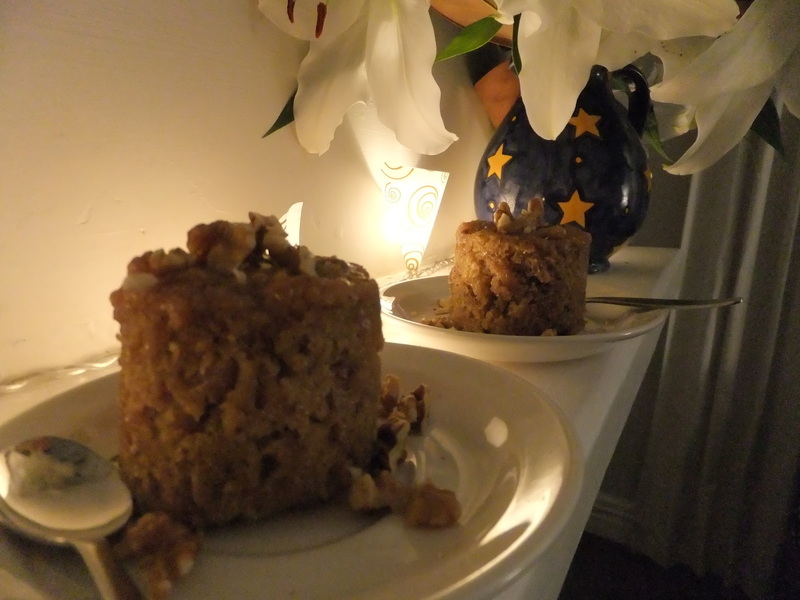 There were indeed sticky date puddings but made in Tex Mex muffin tins. 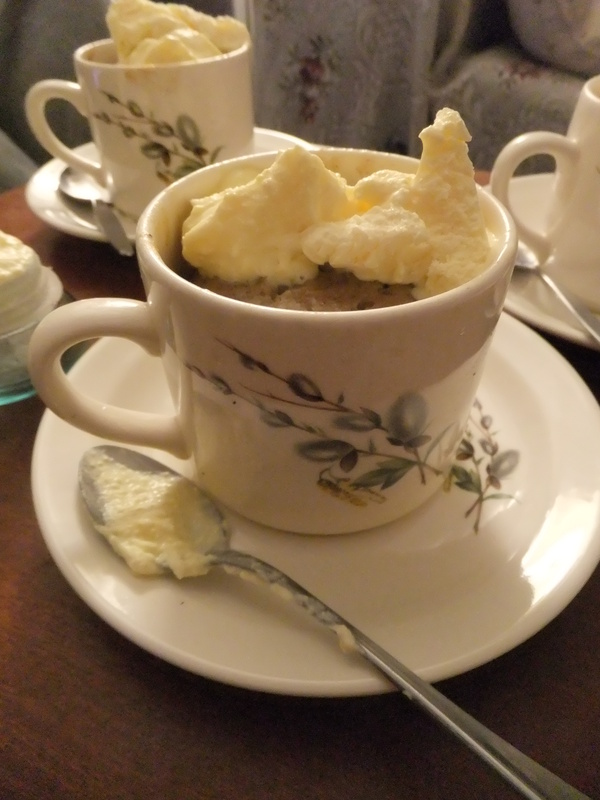 We have eaten quite a few steamed puddings this winter, all made in tea cups. In my flat we have a new tea set, ivory coloured Crown Lynn with a beach-grass design. Last week I used up some of the bananas in our freezer to make banana steamed puddings. I was aiming for a light pudding, the kind that you might eat after a fresh Thai curry. Instead, I made a very wintery, sweet with honey, quite dense sort of pudding. But no less delicious. The honey, the cinnamon and the banana created a moist pudding and definitely more interesting than banana bread or banana cake. I put a handful of raisins into the mix also. Next time I make these I might soak the raisins in a splash of brandy. A pudding will nearly always benefit from plump, brandy saturated raisins. I made these puddings twice in one week. One night we served our tea cups on their saucers with a scoop of vanilla ice cream, and the other night I tipped the puddings upside down onto their saucers and sprinkled bits of walnuts. They were everything my child mind remembered them to be. All we needed was a sneaky thermos of mulled wine. A recipe loosely based on this one from the BBC website. BBC Food has some wonderful recipes. Cream butter and sugar, beating for about 5 minutes. Add eggs, 1 at a time, beating well after each addition. Sift the flour with the spices, add the vanilla essence, sultanas and mashed bananas. Fold together until well combined. Butter 6 ramekins or teacups, spoon a teaspoon of honey in the bottom of each ramekin. Fill each teacup ¾ of the way up. Place teacups in a roasting dish, fill the pan half way up with water and place a piece of tinfoil on top of tea cups. Lightly press the edges of the foil around the tea cups to better enclose the tea cups. Place in the oven for 40-50 minutes or until slightly springy to the touch and a skewer inserted into the middle of the pudding comes out clean. N.B. I don’t think my oven is very powerful so you may want to check your puddings after 30 minutes. A lot of steamed pudding recipes recommend this cooking time. 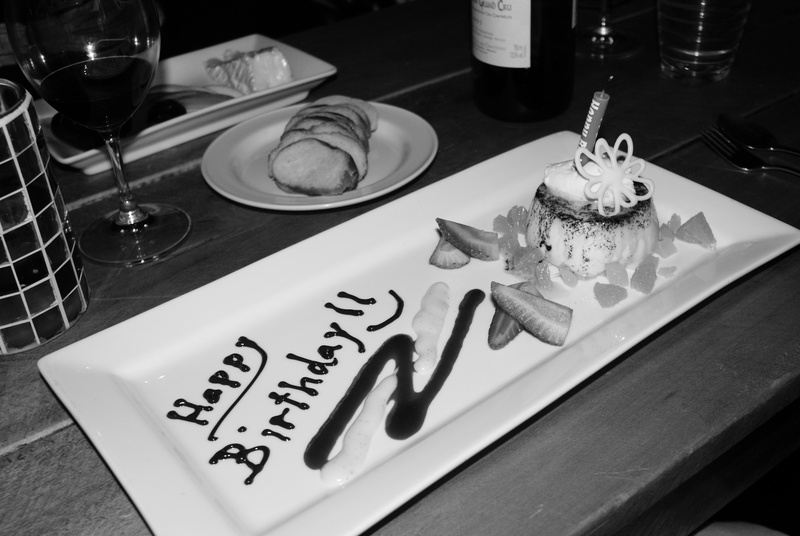 For a rather special birthday, my family dined at Arbitrageur Restaurant and Wine room last night. The atmosphere was casual but still quiet and refined; other diners, men watching the rugby and couples drinking Champagne at the bar. We were seated at a large wooden table, though almost too large for a party of four. I liked the outdoor feel of the table while sinking into high backed, rounded leather loungers. The menu is not long, featuring only a few dishes for each course. But each dish sounds so delicious it is hard to choose. For the entree I had la poitrine de cochon, a succulent and tender piece of pork belly with a fennel and apple compote. Sprinkled on top, like a pale, crunchy, salty candyfloss, was finely grated, fried potato. We drank Spanish bubbly and toasted my twenty-first birthday. For Les Mains I ordered the Pork Butcher’s Wife, a roast pork loin with cherry tomatoes, dark wilted spinach, lardons and baby cornichons. This was utterly sublime. 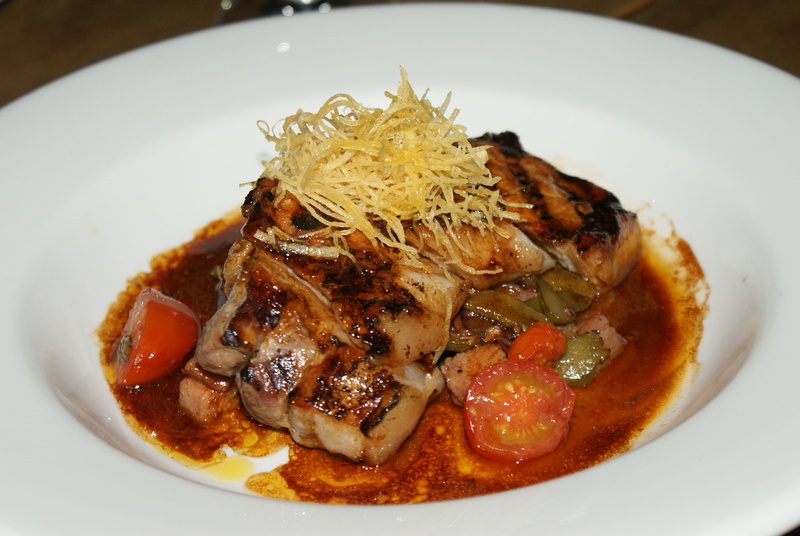 Strong flavours but a pleasant contrast between the acidity of the tomatoes and cornichons and the salt of the pork. The meal was homely with the elegance and sophistication of a wonderful restaurant meal. 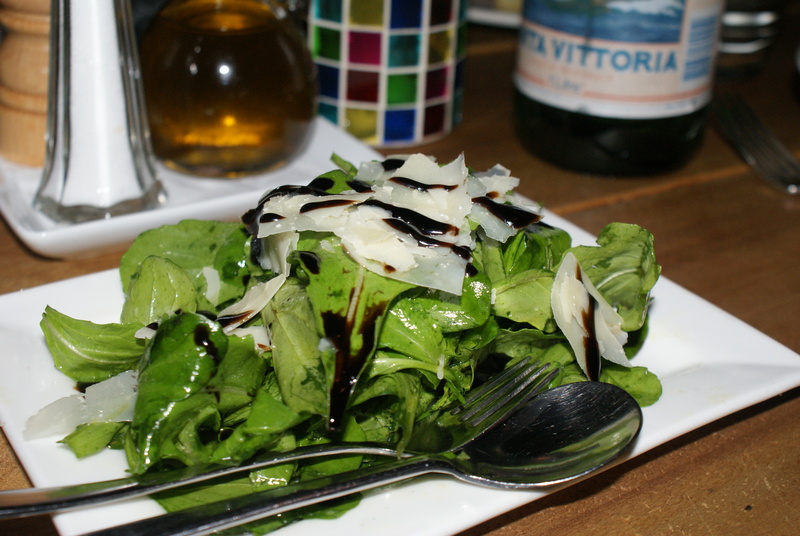 A simple salad as a shared side. Dessert I often find the most difficult of menu decisions. There is a lot of pressure on a dessert to balance or compliment the previous course(s). My sister and I both chose the saffron panna cotta with pineapple and orange. Saffron is a tricky flavour to describe, but it makes for a lovely panna cotta regardless. The speckled and dusted red, velvety dessert was light and refreshing on the palate. Thank you for the photos, Georgie. Sometimes, often in the most ordinary of places, or doing the most ordinary of tasks, a food idea pops into my head. While cleaning my teeth, or sitting on a bus, I will quite suddenly be day dreaming of chai syrup cake, or cinnamon raisin muffins, or chilli caramel corn. Maybe they are prompted by a memory, maybe a forgotten item in the pantry, maybe my sub-conscious is simply a melting pot of culinary thoughts. Last week’s idea was oat cakes. I envisaged quite a substantial cracker, with a slightly flaky crumb held together by the creamy taste and texture of oats. Maybe with a mug of weak black tea and a chopped up apple or piece of dried fruit after dinner. Or paired with a sharp cheddar, a tangy blue and a glass of red wine. I’ve made oat cakes once before, in year 7. We were studying Scotland and I chose to look at Scottish food. When it came to sharing day, the floury, dry, tasteless oat cakes sat untouched next to the infinitely more popular Kiwi onion dip, Mexican tortilla chips, French baguette and German spice cookies. Eleven year olds were more willing to try sushi over my oat cakes. I haven’t made oat cakes since but the slightly romantic notion of a rustic cheese platter and a desire for home made crackers has only grown. After my foodie thought of last week, I felt sure I had a recipe for oat cakes in one of my favourite, but somehow forgotten, cook books, A Good Year by Lois Daish. This is a wonderful cookbook. It is a tiny book with a simple cover of a small bowl of cherries. There is no slightly padded coffee table cover with a self promotional picture of a celebrity chef. This book is simple and elegant. Each time I open it I feel I could quite happily work my way through the book, recipe after recipe. Daish is a New Zealand food writer and the recipes are a compilation from her food column in the Listener magazine. This book follows a calendar year with a lovely introduction for each month focusing on one ingredient. For July, “Intensely sweet, sour and spicy, dark red tamarillos are a perfect tonic for a New Zealand winter.” And for November, “Strawberries, which are the first berries to ripen, are a sweet harbinger of all the berries to come – gooseberries, raspberries, loganberries, boysenberries, blueberries, blackberries, and currents – black and red.” The writing is beautiful. 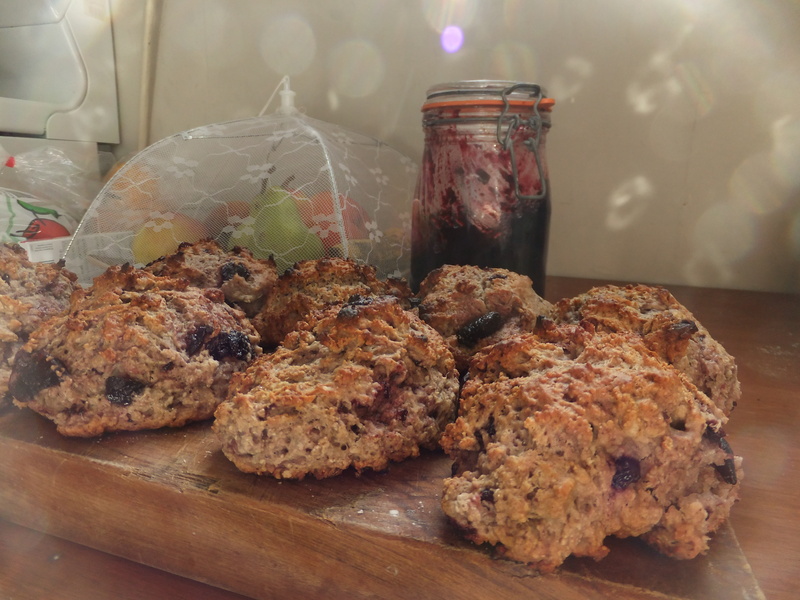 A Good Year does indeed include a recipe for oat cakes. Daish credits this recipe for oat cakes to Roy Duncan, which he gave to her after she complained her oat cakes tasted a bit like mine from year 7, dried porridge cardboard. These oat cakes were just as I imagined. 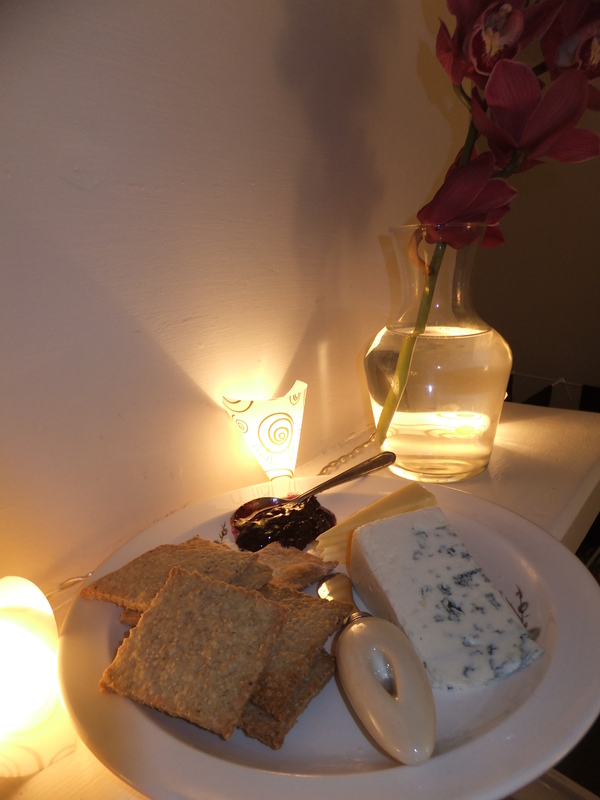 Eaten with a crumbly, sharp blue and the last little bit of plum jam, they had a pleasant crunch and a mellow taste. Preheat the oven to 170°C. Mix the dry ingredients together and pour in the butter and hot water. Knead in the bowl until the mixture holds together. 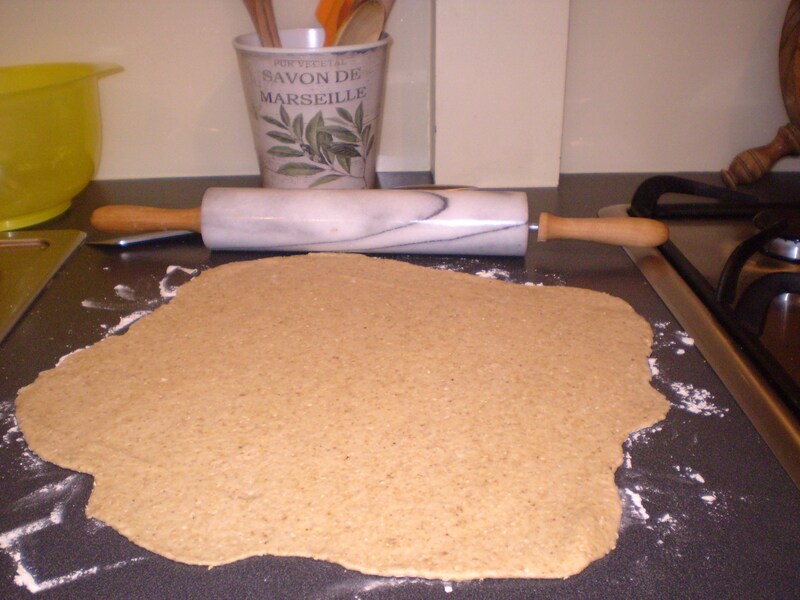 Tip onto a lightly floured bench and knead a little more before rolling out thinly. Cut into large squares and use a spatula to transfer to a baking tray lined with baking paper. Bake for 10-15 minutes until light brown and crisp. 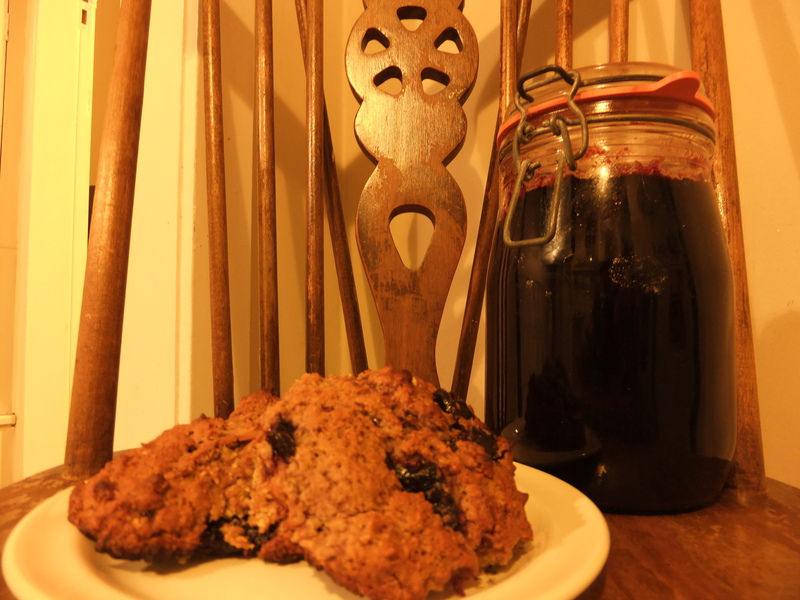 A good friend of mine, Ollie, gave our flat a huge mason jar of plum jam made by his mother, Anna. It is the deepest purple colour, thick with glossy pieces of plum smudged into a set syrup. I have a weakness for condiments: jams, preserves, chutneys, pickles, conserves, jellies, curds and fruit pastes. A happy fridge is one with the top shelf full of interesting jars. An eclectic collection to be paired with cheese, slathered in sandwiches, or, eaten straight from the jar. One day I hope to live in a kitchen lined with shelves of my own home-made pickles, chutneys and preserves. Anna’s plum jam is worthy of higher things than jam on toast. In saying that, this jam has such a rich plummy taste it is like spreading the ripest, juiciest, hot-from-summer plums on to your toast. 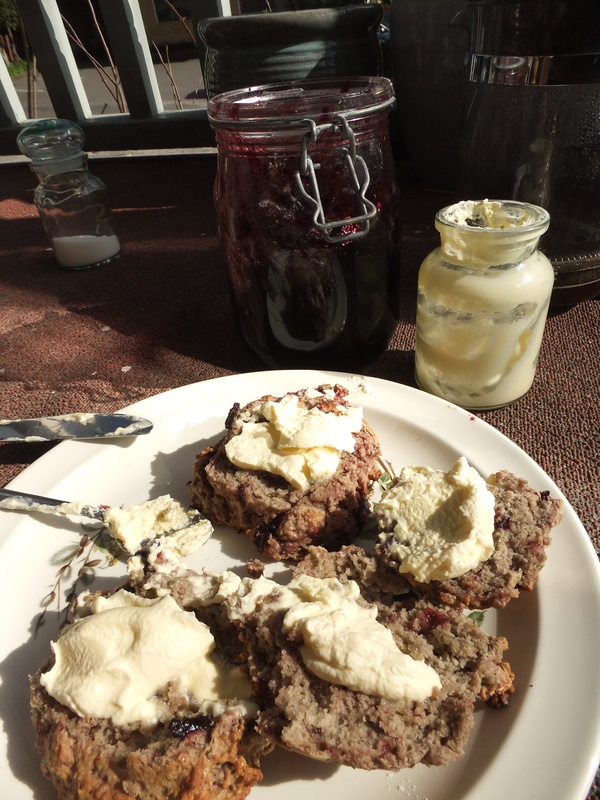 I thought a good experiment could be to mix some plum jam through a scone mix. This turned out to be a rather nice idea. More interesting than date or sultana scones and delightfully versatile. As a breakfast scone, consider it already pre-jammed; though for a morning tea, a spoonful of cream and more jam creates quite a luxurious scone. These scones are nubbly, as if made with bran. Take a bite and there are twice cooked plums melting into molten pockets. They are a bit rough around the edges: I’m a dollop of scone mix sort of girl, instead of a rolled-and-cut scone girl. I think these scones could be improved by a sprinkling of demerara sugar on top before going in the oven. I am also curious to try adding ginger, powdered or finely chopped crystallised, to the mix. Pre-heat oven to 220°C. Sift dry ingredients together. Rub in the butter until the flour is slightly crumbly. In a separate bowl lightly stir the jam through the milk until the milk begins to change colour and the plum bits are broken up a bit. Add the wet ingredients to the dry and roughly mix. Spoon onto a very well greased baking tray-the plum pieces do tend to stick. Bake for 15mins until lightly browned on top.